“Whose arms are killing Yemen civilians?” Our arms are. 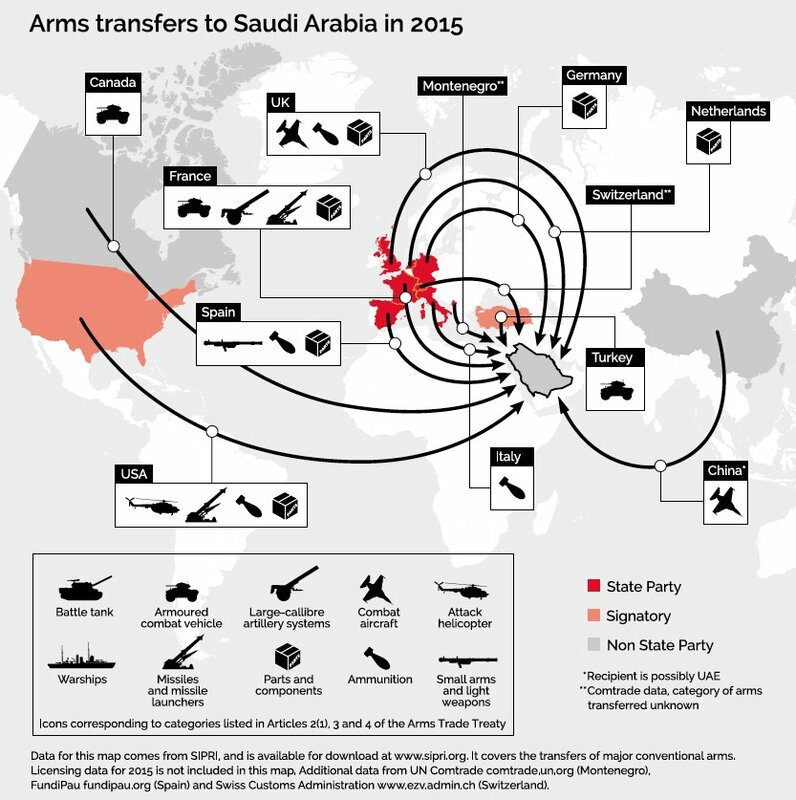 Between January 1 and September 30 2015, the UK issued a total of 152 licences for exports of military equipment to Saudi Arabia, totalling $4.16bn – seven of these licences were worth a total of more than £1bn for bombs, torpedoes, rockets and missiles. The UN and Médecins Sans Frontières have said Saudi Arabia is contributing to a “humanitarian disaster” in Yemen. This sits nicely with another top story today, as the Independent’s Jon Stone reports: “The European Parliament’s support for an arms embargo on Saudi Arabia shows why Britain must leave the European Union, one of the EU referendum “leave” campaigns has said. Leave.EU said the EP’s 359 to 212 vote to back an EU-wide end to weapons sales to the autocratic petrostate risked starting a “damaging trade war”. More here. Got that? We need to leave the EU because they are stopping us flogging arms to Saudi Arabia. Is this the future of a low-tax, low-wage, hyper-free-market “Britain” that the Outers yearn for? Yes, and we know so because that’s what they’ve told us. The backstory to the right and far-right’s mission to ‘set us free’ has some pretty clear ideology behind it. While it’s easy to laugh at Mandy Boylett and her crowd (and we do), the further up the Tory Out campaign you go it doesn’t get any less crazy. We have Nigel Lawson suggesting that Ireland would ‘realise its mistake’ and ‘rejoin the UK’ and we have the terrifying Priti Patel, now Minister of State at the Department for Work and Pensions, who is advocating a return to hanging, a practice that is banned in Europe. In fact abolition is a condition of membership of the European Union. In that sense, the moral logic for Patel is complete. Support for arms sales to Saudi Arabia is a simple act of economic freedom, and state murder would become a common policy. It’s a frightening thought what a Britannia Unchained would look like. The more the right articulate their vision the scarier it becomes. These are not people on the fringe, these are people at the very heart of government today. Yes, very well put, and I think you assess their logic correctly. Where did that phrase ‘hyper-free-market’- come from? Is that yours or did someone else use it? If yours, is it intended as a check on the idea of free-market solutions to situations, this one included, are not advisable? It’s mine and it’s said advisedly after having the misfortune to read Britannia Unchained, which I suggest you do. It’s chilling. Thanks . . . I shall. Hyper free market. It’s nothing of the sort. The UK and EU economy is actually very structured with arguably too much government intervention (how else do they keep producing new markets? A common misunderstanding about contemporary Freidmanite economics (or neo liberalism) is that it is the same as classical free market liberal econ. It isn’t. And there in lies the problem as the market is distorted by deliberately facilitated capital. ‘Market power’ it’s called. It’s anything but free and open, but closed and controlled. Excellent! The writer could have added that under the International Criminal Court rules, anyone committing a war crime or crime against humanity (especially a crime of aggression – the most heinous crime in the Nuremberg Judgements) is clearly guilty … but so is anyone who facilitates such crimes; even those who are aware of the crimes and fail to report them make themselves complicit. Unfortunately, it has become obvious that the ICC was set up to try only the alleged ‘enemies’ of the West – not the war criminals in our own and other governments. The UK is so full of its self, but then you have to be, when you fancy yourself as the Euro police, or bomb countries to promote the latest weaponry like some kind of war festival. ” Britannia unchained ” ? What like the White paper, low corp tax like Ireland, cheap credit and oil based econ ‘the SNP vision for an indy Scotland?’ That many objected to? Hypocrisy is not a good look when moralising. Why aren’t you having a go at Sturgeon also for allowing the cluster bombs and drones that maim and kill and are sold to Humza Yousefs human rights abusing pals in the UAE? Otherwise it looks like you are simply using other people’s suffering to further your own anti British agenda and not actually hugely bothered about the Yemeni’s at all? The 1930s Nazis stuffed millions into the gas chambers. Does anyone think our arms industry today is any different. But hey, it’s business and a business that makes big bucks and we’re the good guys. Our moral vacuum let’s us sleep at night. One couldn’t really imagine the societal benefit of diverting all that military capacity into manufacturing and research into non military activities. And can anyone imagine the business opportunities if the IRA set off a few big spectaculars every couple of weeks in London. I mean it’d keep fire ambulance doctors and nurses busy whilst engaging all manner of reconstruction. Nonsense do I hear you shout. Well yes moral nonsense, but that is effectively what we do. That inexorably is where the ever increasing focus on weaponry ultimately takes us and it certainly seems that the human race is incapable of moving off this trajectory.